The Worcester Railers took to the DCU Center ice Friday night for a game against the Maine Mariners looking for a regulation win to jump back into one of the playoff spots in the ECHL’s North Division. Things started off great for the Railers when Bo Brauer picked off a Mariners centering feed and pushed the puck up toward his own blueline. Matty Gaudreau was just able to get a stick on the puck and push it forward and out of the zone where a streaking Tyler Mueller took possession. He skated down the left side on a two on one with Josh Holmstrom, freezing the defenseman and firing a laser over the glove of Mariners goaltender Chris Nell and just inside the far top corner for the 1-0 lead 3:43 into the contest. Currently the assist are listed as Gaudreau and Connor Doherty, but Brauer should get the secondary helper on the play. Unfortunately for the Worcester faithful at the game that was the last time Friday that the Railers would light the lamp. Part of that had to do with Worcester continually shooting the puck toward the blocker side of Nell, who has shown throughout the season to be pretty good to that side. Worcester did actually beat Nell two more times, but shots by Tyler Barnes and Barry Almeida bounded away harmlessly after hitting the post. Winning games 1-0 is rare in hockey, and Worcester lost their chance of that early in the third period when they got caught running around in their own zone. Eventually the puck found its way to the stick of defenseman Johnny Coughlin, and his shot on goal was tipped by Greg Chase and past Railers goaltender Mitch Gillam at 8:08 of the period. Referee Jacob Rekucki went to video review on the goal for no reason anyone can fathom, and soon confirmed it was a good goal. To overtime the teams went, and Worcester controlled the first couple of minutes but once again couldn’t get one past Nell. With so much open ice turnovers in the extra session are killers, and a turnover at center ice sent Maine in on a two on one. Ivan Chukarov made a nice block of Chase’s first bid, but the puck bounced into the air where Chase batted it home at 3:00 for the 2-1 Mariners win. 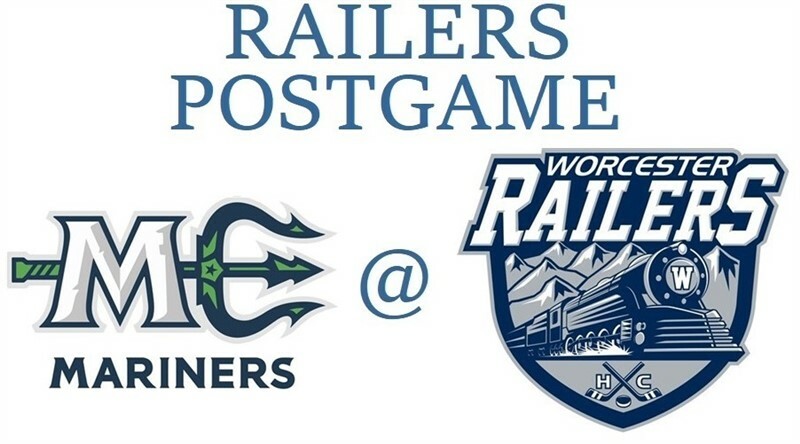 The Railers will now head to Manchester for a Saturday night contest against the Monarchs. Puck drop is 6pm. Scratches for the Railers were are Evan Buitenhuis (Day to day/lower body), Drew Callin, Kyle McKenzie (14-day IR/season), Ross Olsson, Tommy Panico (14-day IR/season), and Alex Vanier (14-day IR/upper). Blake Wojtala was the back-up netminder. Earlier this week Worcester released Charley Michalowski and Spencer Trapp and signed forward Drew Callin from Bentley University. He was voted this season’s Best Defensive Forward by The Atlantic Hockey Media Association. There wasn’t much good news on the injury front for the players not already announced as out for the season. Buitenhuis hasn’t begun skating yet so his return doesn’t seem imminent. There was no other update on Vanier other than he’s not playing this weekend. There’s been no official word as to what is specifically injured on either player. With his two fights in the game, as if the one-sided beat downs of Ryan Ferrill and Derek Pratt were anything close to a fight, Yanick Turcotte jumps to 19th all-time in Worcester pro hockey history with 331 penalty minutes. He knocks current Bridgeport Sound Tigers assistant coach Eric Boguniecki (327) out of the top-20 and drops Jason Widmer (330) into the 20th spot. Turcotte gas a good chance to catch Sylvain Blouin’s 337 penalty minutes this weekend. Blouin’s total is the Worcester pro hockey record for a single season. Had a great pregame conversation with DCU Center General Manager Sandy Dunn about some of the proposed area upgrades, and contrary to what some of the rumors surfacing are saying she echoed the comments made by Railers Senior Account Executive Connor Haynes posted in the Railers Fans Facebook group, saying the DCU Center is a City owned building and none of the costs of the upgrades are the responsibility of the tenants of the building. Dunn also mentioned that many of the specific upgrades are still in the planning and development stages and that the timetable for each upgrade hasn’t been finalized yet. With is being the first game of a new week we’ll do as we’ve done all season and take a look at the voting for “Railers Player of the Week” over on the Railers Fans Facebook group, and this week’s winner is Tyler Barnes. It was a runway as he got 50 of the 63 votes cast by the deadline. This writer expected it to be a lot closer with both Barry Almeida and Ryan Hitchcock also having big weeks. But alas, the people have spoken. On this day, March 23th, in Worcester hockey history…in 2003 the IceCats qualified for the post-season with a come-from-behind 2-2 tie versus the Saint John Flames. Jason Dawe scored the game-tying goal for the IceCats at 7:44 of the third, just 33 seconds after Ernie Hartlieb cut the Flames lead in half. Worcester goaltender Curtis Sanford stopped nine shots in the overtime session and 35 overall…in 2006 the WorSharks scored four second period goal to defeat the Wolf Pack in Hartford 5-2. Graham Mink, Garrett Stafford, Tom Cavanagh, and Lukas Kaspar all had goals in the frame, and Mink added a late empty net goal to close out the scoring. Josh Prudden had two helpers, and Thomas Greiss made 38 saves…in 2010 Andrew Desjardins had a pair of goals and T.J. Trevelyan added a late insurance marker to give the WorSharks a 3-1 win over Syracuse. Dan DaSilva assisted on both of Desjardins’ goals and Alex Stalock made 24 saves in the win…in 2013 the WorSharks got goals from Freddie Hamilton, Peter Sivak, Travis Oleksuk, Sebastian Stalberg, and Denny Urban to defeat Providence 5-3. John McCarthy chipped in two assists, and Harri Sateri made 28 saves…in 2018 the Railers used third period goals by Josh Holmstrom, Barry Almeida, and Matt Lane to defeat the Royals in Reading 4-1. Mike Cornell opened the scoring and Nick Saracino added three assists. Mitch Gillam made 29 saves in the win. 1st Period-1, Worcester, Mueller 2 (Gaudreau, Doherty), 3:43. Penalties-Schmalz Wor (cross-checking), 19:39. 2nd Period- No Scoring.Penalties-Ferrill Mne (fighting – major), 5:08; Turcotte Wor (fighting – major), 5:08; Almeida Wor (hooking), 10:15; Cammarata Mne (roughing), 16:27; Cecere Mne (roughing), 16:27; Doherty Wor (roughing), 16:27; Pratt Mne (fighting – major), 19:36; Turcotte Wor (fighting – major), 19:36. 3rd Period-2, Maine, Chase 21 (Coughlin, Kessel), 8:08. Penalties-Kelley Wor (hooking), 3:32; McNicholas Mne (tripping), 9:40. Shots on Goal-Maine 9-8-10-3-30. Worcester 12-6-11-2-31. Power Play Opportunities-Maine 0 / 3; Worcester 0 / 2. Goalies-Maine, Nell 14-18-0-2 (31 shots-30 saves). Worcester, Gillam 19-13-2-3 (30 shots-28 saves). Linesmen-Nathan Frechette (30), Shane Kanaly (39).